Food plots are a valuable tool for game and trophy management. They can be expensive if maintained year round, leaving the deer without essential minerals. Homemade deer mineral attractants provide an inexpensive alternative to the high-priced food plot and commercially processed minerals. Homemade minerals can also be customized based on your specific soil composition. The three ingredients to a homemade deer mineral attractant can be found at your local farm supply stores. Purchase one 50-pound bag of dicalcium phosphate from your local feed store for around $11. Dicalcium phosphate helps in food digestion and weight gain. The second ingredient is trace mineral salt. Find the salt without medications and purchase two 50-pound bags for around $5 per bag. The final ingredient is stock salt, or ice cream salt. One 50-pound bag will cost around $2. The salts help to attract the deer and keep the deer coming to the attractant. 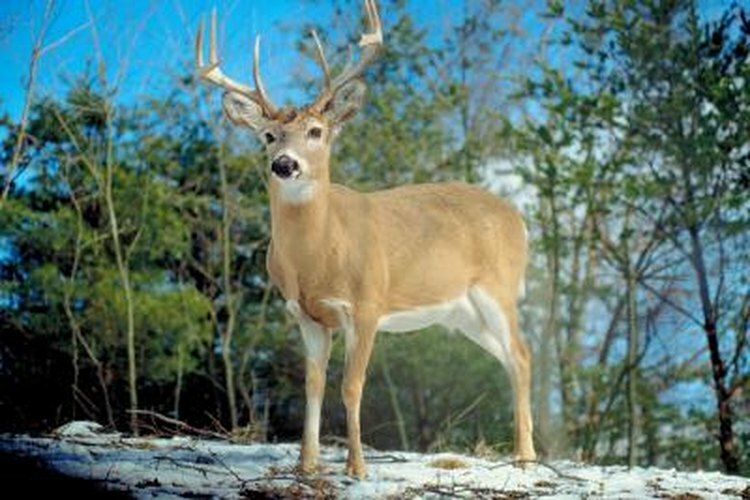 It also provides trace minerals like magnesium and potassium that aid in antler growth. Mix all four bags for a total of 200 pounds of mineral attractant in a large barrel and use a small coffee can to spread it over stumps and other vegetation. Dig a hole about 6 inches deep and mix the mineral mixture into the soil. Put up a trail camera nearby to track deer movement. Replace about every four to six months or as necessary based on the deer herd.